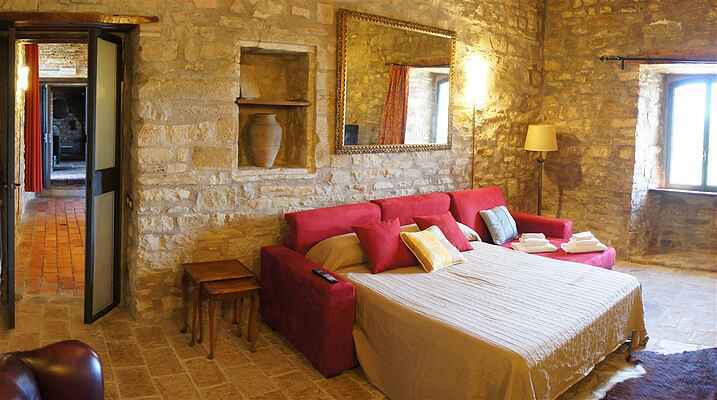 Palazzo Scagliae is currently arranged to sleep 8 or more guests over 3 floors. It has 2 double bedrooms, a twin room, a double sofa bed and a single sofa bed. There are 5 bathrooms with 4 showers, 2 living/lounge rooms with TVs, rustic kitchen, a dining room with antique furniture, a reading room and an outside terrace with 8 person jacuzzi hot tub. The Palazzo is furnished with many period antiques and art work. Additional beds can be installed in the lower floors upon request, and a baby cot is available for no extra cost. Unlike other holiday villas in Umbria, you will have exclusive and sole use of the entire Palazzo when you book with us! There is a large stone pizza oven that you can use, as well as a cool underground secure car park. If you wonder around the grounds, you will come across many varieties of trees and flowers, and bump into frogs and dragon flies around the pond. There is also the old original stone well towards the bottom of the grounds. Despite being less than 20 minutes (12km) from the center of Gubbio, Palazzo Scagliae is exceptionally peaceful, situated on top of the mountain with dominating and undisturbed views over unspoilt, valleys, hills and countryside. The main access road to Palazzo Scagliae is tarmac and consequently the property is easily accessible by car throughout the year. Perugia, Assisi, Urbino, Siena, Todi, Spoleto, Rome and Florence are all within reach for day visits, and you can visit the lovely beaches of the Adriatic coast in a little over an hour. The top floor has 2 double rooms, 2 bathrooms with showers and a TV/Lounge room which has been furnished with leather Chesterfield sofas. Bedroom 1 has a small fireplace and ensuite bathroom with shower. The room is furnished with a cast iron double bed, wardrobe, bedside cabinets, a small antique bureau and an antique chaise lounge. Bedroom 2 has a cast iron double bed, wardrobe, bed side cabinets and desk. It also has antique chairs and inlayed cabinet. Here you have fantastic views of the surrounding mountains from 3 arched windows, and a little ‘Romeo & Juliet’ balcony. The middle room is used as a sitting/TV room and also has a bathroom with shower. This area can be used to relax in and watch satellite TV. It also has a large fireplace. The lounge is furnished with a leather Chesterfield sofa and armchair, as well as coffee tables. You have a ceramic basin, gas oven cooker, dish washer, fridge freezer, microwave, espresso machine, kettle & toaster. There is a large table with benches and 4 chairs. The floor is the original stone floor of the house. The dining room on the ground floor is furnished with mahogany dining set including table, chairs, side and display cabinets. It has vaulted ceiling and terracotta flooring. The living/TV room has a large double sofa bed (full pullout mattress), a large antique wardrobe and a single leather Chesterfield armchair. The room has a nice wooden beam ceiling and old terracotta floor. There is also a large bathroom with shower, large mirror with Tiffany lamps and a washing machine. Here you can also see traces of the water collection system used in the past. The lower floor consists of 3 rooms and 2 bathrooms. Here we can add additional beds if required. One of the stable rooms is currently furnished with a single sofa bed, single bed, wardrobe and side cabinet. The furthest stable room is used to store any outdoor furniture such as loungers, recliners and umbrellas, and from here you can access the paved terrace and hot tub area. The first room closest to the stairs is the old milling room. You will see the original milling stone on the wall and various collection chambers dug into the floor. The room is furnished with a round table and chairs.